For the past 2 years, I had my share of Android phone. Recently I decided I had enough of the platform and made the switch back to IOS. It was an interesting decision to make. The Android platform boosts a wealth of innovative features over the IOS. However one thing that irks me was that the interface that I previously encountered was a little messy and unstable. However my opinion swayed when I met the fuss free mid budget Honor 6 from HUAWEI. Weighing in at 130g, the phone comes with a decent 5 inch screen. It may not be made of premium metal but the look and feel of the plastic materials are pretty decent. In fact , you could hardly tell the difference in quality. There is no branding on the front of the phone. Visible buttons are also missing on the phone and navigation can be done on the screen itself. The phone is branded Honor on the back with a 3D effect on it. There is a back translucent cover provided for those who intend to use the phone without a cover. The volume control and the On/Off switch is located on the right side. The slots for the Micro-SIM card and the Micro-USB are located on the left. The top side has slot for a 3.5mm jack, an IR blaster and the microphone. First impression counts. The verdict - thumbs up for me. This looks like a phone I can hold comfortably and use. In addition, the size of the phone is kid friendly too. Armed with Android 4.4.2 (Kitkat), the user interface is clean and familiar. I am glad to note that it is easy to use and navigate. There used to be a time when the transition from IOS to Android may be complicated due to the interface. This is especially so if the Android skin is filled with bells and whistles. However with the Honor 6, I feel this simple interface is a positive for the phone. There is no steep learning curve, it is simply a case of unwrap and go. With HUAWEI Hisilicon Kirin 920 octa-core processor which uses 4 x A15 cores and four 1.3 X A7 cores plus 3 GB of ram, the Honor 6 is no slouch. If the long and imposing name of the processor does not impress you, the speed will. One thing that I look for in a phone is space. Parents with kids, you would want space to load the videos and photos you take. A phone with limited capacity will fill up fast with the addition need for YouTube videos and apps for kids. Thankfully the Honor 6 addresses this with 16GB of internal storage and an extra 64GB of space you can use by adding a micro SD Card. Ok, you got me. I let my children play with the smartphone. It is only because I believe in sharing toys with my boys. Surfing the web is also a breeze with the build in browser. Given its decent size of 5 inch, web surfing on a desktop mode is possible. The screen resolution of 1080 x 1920 will give you full HD definition to enhance the viewing experience. With 4G LTE and a speed of 300Mbps. Surfing is a blaze too! One of my pet peeve with my previous Android phone is the quality of photos from the phone. They boost a spectacular x number of megapixels and a wide range of functions on paper. However if the picture quality is bad, it is as good as useless. Honor 6 comes equipped with a F2.0 aperture 13- megapixel rear camera and a 5-megapixel front camera. The camera app equipped with it has several shooting modes and filters you can explore. This includes Panorama, HDR and even one that you can add Watermark to. The last feature is great for photographers and bloggers who wants to keep their photos copyright. As an amateur photographer, I am quite impress with the camera function, just take a look at the photo above in comparison. 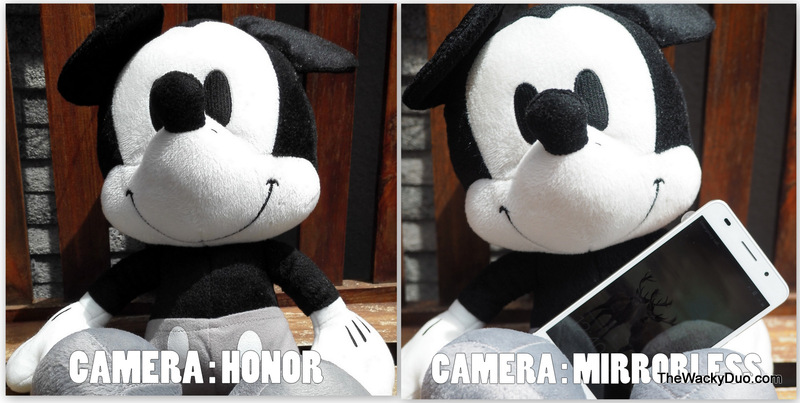 The photo taken from Honor 6 (on the left) has more fine details in comparison to the one I took with my pro mirror-less camera. The front camera is not too shabby either. With the current fab on selfies, the front facing 5 megapixels churns out good quality photos. The 88 inch large viewing angle is perfect for a panoramic selfie. This is definitely a plus for the selfie fan. The Honor may not win the most innovative looking phone award but it is top class in terms of features against competitors in the same price range. It might be even be a decent option to consider if you intend to get a smart phone for your school going kids this Christmas! For more information, head down to Huawei Singapore new flagship store at Plaza Singapura #03-78. Alternatively visit Huawei facebook page for more details.